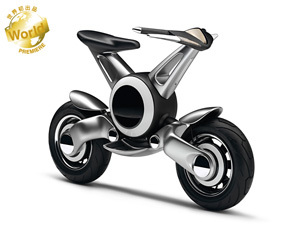 About the Yamaha Booth For the 41st Tokyo Motor Show 2009 | Yamaha Motor Co., Ltd. The EC-03 is 100% electric powered commuter vehicle developed with a concept of "Light, Smart, Clean and Silent." 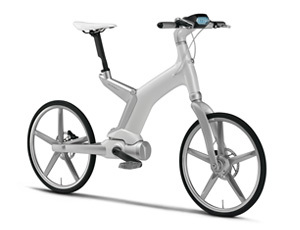 It mounts a slim electric power unit and lithium-ion battery on a lightweight aluminum frame. With Yamaha-exclusive motor control technology it provides smooth start-ups and acceleration. The charger is built into the vehicle for easy recharging from a home electric outlet. 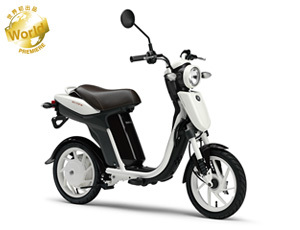 The EC-f and EC-fs are electric commuter vehicles designed to make motorcycle riding easy and familiar for many people of all ages regardless of riding experience. They feature simplicity of operation that only an electric vehicle can provide, plus futuristic styling. Their ease of use, quietness and smoothness make riding a joy. The EC-f features a color scheme accentuating its cleanness as a commuter vehicle, while the EC-fs coloring accentuates stylishness. Control x in-hub 8-speed gear mechanism) that provides an appropriate assist level for each gear to ensure a sporty ride in all conditions and speed ranges, from start-ups and acceleration to cruising. This display model is outfitted with quality finish and special parts chosen to heighten pride of ownership and accentuate the stylish appearance. 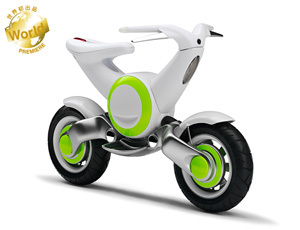 The "PAS er" is a prototype model developed on the concept of a more advanced hybrid relationship between the rider and the motor. It adopts a two-wheel-drive mechanism that applies the electric motor "assist" is applied to both the front and rear wheels and an automatic electronic gear shift (transmission). Together they contribute to a smooth, enjoyable ride even over changing road surface conditions. The motor of the front wheel is also designed with a regenerative function that charges the battery during deceleration or downhill riding. There is also a sensor to monitors the rider's rate of heartbeat and adjust the assist level to help maintain an appropriate level of rider exertion. To accompany this function, there is a large LCD meter panel with a speedometer and multi-information display showing calorie consumption, etc. 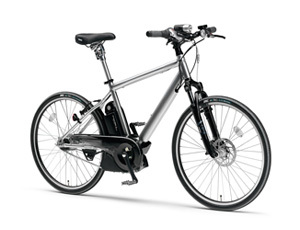 The model also adopts shaft drive and styling defined by a simple design. 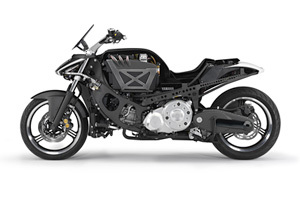 A compact hybrid system sized to fit into a motorcycle. As a hybrid it is environment-conscious with low emissions and improved fuel efficiency, while also providing the enjoyment of high quality acceleration feeling and pleasurable cruising performance. Yamaha Motor is continuing research and development of compact and smart hybrid motorcycles as part of our corporate mission of achieving both environmentally sound performance and Kando*.